For years former Marine Jordyn Bridger has been in love with a man who refused to see her as anything but his best friend’s little sister. A mind-blowing kiss finally changed that, but then he disappeared from her life. 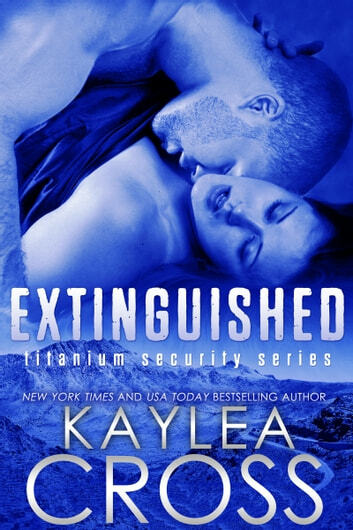 Now he’s back, to recruit her for a job with his NSA-sanctioned Titanium Security team. They’re going after the terrorist responsible for the recent attacks on their team and Jordyn is eager to lend her skill set to the hunt. She’s determined to prove to Blake that she’s capable of holding her own—both in the bedroom and on the battlefield. Former Marine Scout/Sniper Blake Ellis hid his true feelings for Jordyn for years out of respect for her and her family, but once he learns those feelings aren’t one-sided, he can’t keep his distance any longer. When a team tragedy thrusts Jordyn into the front line with him on a battlefield, Blake will do whatever it takes to protect her. She’s everything he ever wanted in a woman but he was too stubborn to see it. Now it might be too late for them. As they race to capture the terrorist they’re hunting, Blake and Jordyn find themselves fighting for their lives. If they want to make it out alive they must work together to defeat an unseen, powerful network that will stop at nothing until their entire team is dead. Only one part of the book that I did not like. And that is the injury of Sean Dunphy. And I have to wait to the next book to see what type of damage he has! With Hunter, Gage, and Sean all paired off, it's time for Blake's story in the Titanium Security series. We also get some follow-up on the characters we have have come to know in the first 3 books, as well as what is obviously a plot-laying for a story involving big boss Alex and his ex, Grace. The heroine is smart and proficient at her job, a former Marine and mechanic who takes a job with Titanium for financial reasons and more importantly... to get close to Blake. Her late brother was best friends with Blake, and she has known him - and loved him- for years. My only objection to the inner monologue of Jordyn is that as a former Marine and some kind of specialist in the marksmen department, I doubt she would be having thoughts about being so glad that the guys accept her as one of their own, and all that crap. She'd be all business, doing her damn job just like all the others, and not having her thoughts imply that she is somehow a second-class operative to those guys. I don't doubt that female soldiers in these circumstances- the few that there are - DO have to prove their worth to their comrades, I just doubt that their inner thoughts are of the "I'm so glad they accept and respect me" variety. The subtext here is that the guys, the heroine, and the author herself thinks that women in battle are kind 3/4 of a soldier...like "pretty good, you know, for a woman". While I respect the author's research and her dedication to honouring military personnel with her stories, I think that in some ways her crafting of this story does female military members a disservice. Unlike her Bagram series, where 2 of the women were pilots, and so had only had the most basic weapon training compared to the SEALs they were romantically linked to, this female character was a full-on Marine for four years. It should not ever be implied that she is any less able than the men, since it's doubtful to me that any real Marine would be. This is a nagging annoyance of mine, but overall the story is well-paced and gripping, and picks up right where Sean and Zahra's story ends.